Welcome to Marspans.com, this site is dedicated to the incredible Martian vistas captured by the twin Mars Exploration Rovers, Spirit and Opportunity. 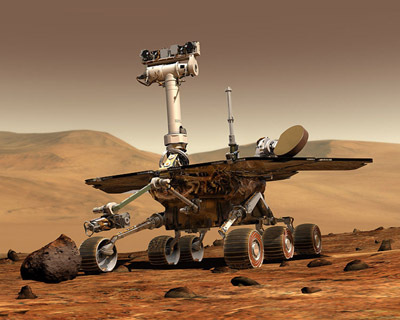 The first of the rovers to successfully land on the Martian surface was Spirit on January 4th 2004, followed by opportunity on the 25th January 2004. The Mission was originally meant to last only 90 Martian Days (Sols) but with the Rover's powered by cleanable solar arrays, the rover are still performing today. The panoramas on this site were captured by the panoramic cameras, and are assemblies of dozens of hi-res digital photos stitched together to form extremely large panoramic assemblies.